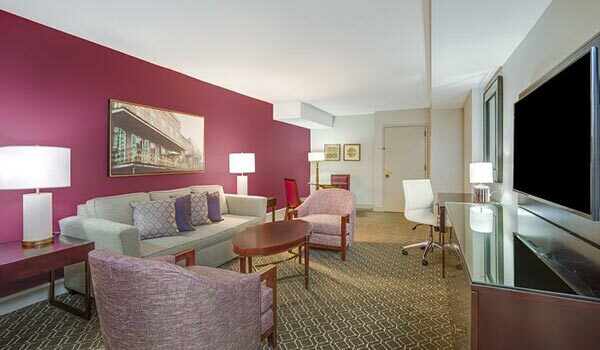 Blending comfort with class in the heart of the French Quarter, the newly renovated Astor Crowne Plaza New Orleans provides luxury accommodations, equipped with a stellar collection of amenities and conveniences. Immerse yourself within a tranquil respite, complete with executive work desks and high-definition, flat-screen televisions. Our beautiful rooms and suites are thoughtfully-appointed with elegant furnishings, wall coverings and drape, which reflect our hotel's sleek yet traditional style. 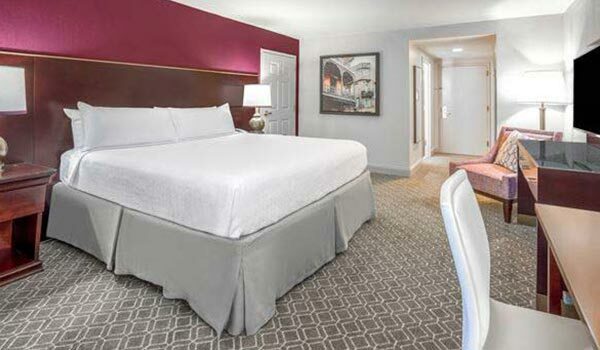 We also provide 24-hour room service, complimentary Wi-Fi and an attentive, professional concierge for a comfortable, relaxing stay in one of the premier luxury hotels in New Orleans. A newly renovated modern king bed guestroom offering an executive work desk and chair, spacious bathroom with granite vanity and 49” HDTV. Free basic High Speed wireless internet is available and upgraded speeds for optional purchase. The hotel is 100 percent nonsmoking. 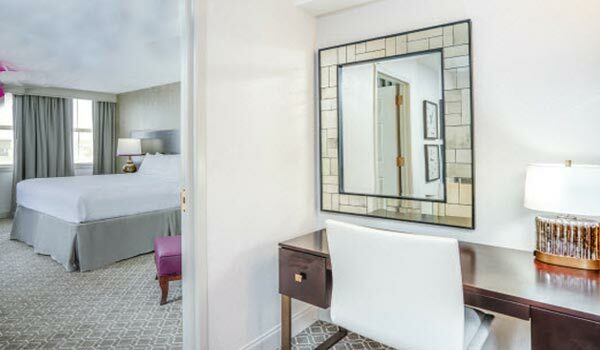 A newly renovated modern two queen bedded guestroom offering an executive work desk and chair, spacious bathroom with granite vanity and 49” HDTV. Free basic High Speed wireless internet is available and upgraded speeds for optional purchase. The hotel is 100 percent nonsmoking. 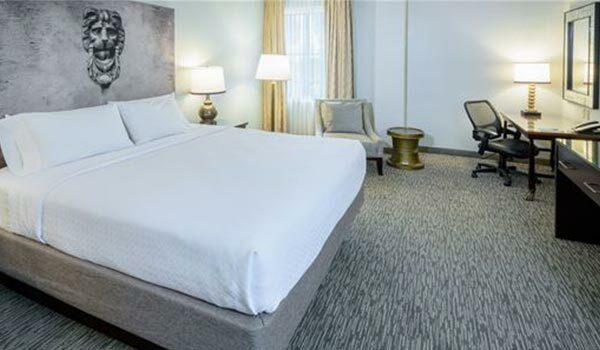 Enjoy the city view of New Orleans in a modern Newly renovated guestroom and features 1 king bed for up to two guests, an executive work desk and chair, spacious bathroom with granite vanity and 49” HDTV. Free basic High Speed wireless internet is available and upgraded speeds for optional purchase. The hotel is 100 percent nonsmoking. 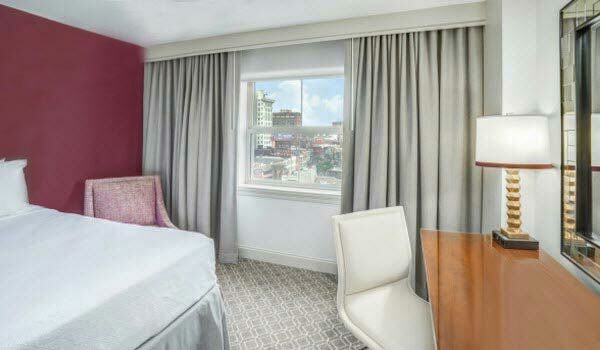 Enjoy city views of New Orleans in a newly renovated guestroom featuring two queen beds for up to 4 guests. Stay productive with an executive work desk and chair, spacious bathroom with granite vanity and 49” HDTV. Free basic High Speed wireless internet is available and upgraded speeds for optional purchase. The hotel is 100 percent nonsmoking. A newly renovated modern king bed guestroom with an additional parlor rooms with a sleeper sofa and living room furniture. This room offers an executive work desk and chair, spacious bathroom with granite vanity and 49" HDTV. Free basic High Speed wireless internet is available and upgraded speeds for optional purchase. The hotel is 100 percent nonsmoking. A newly renovated modern two queen bedded guestroom with an additional parlor rooms with a sleeper sofa and living room furniture. 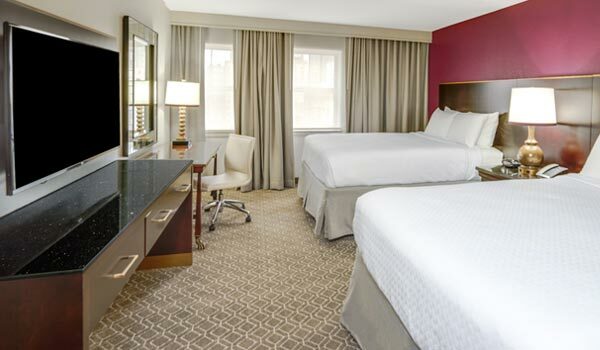 This room offers an executive work desk and chair, spacious bathroom with granite vanity and 49" HDTV. Free basic High Speed wireless internet is available and upgraded speeds for optional purchase. The hotel is 100 percent nonsmoking. 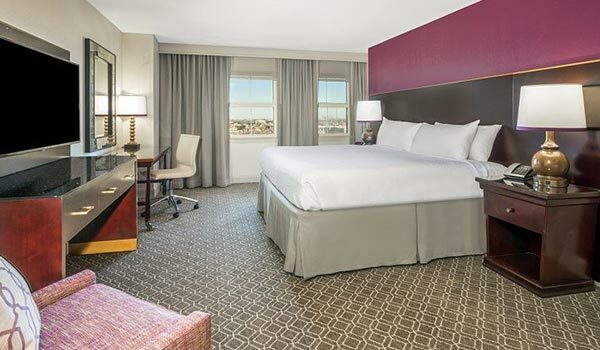 A newly renovated room located in the Alexa Tower, this room features one king bed, an executive work desk and chair, spacious bathroom, high ceilings, and pay movie channels. Free basic High Speed wireless internet is available and upgraded speeds for optional purchase. The hotel is 100 percent nonsmoking. 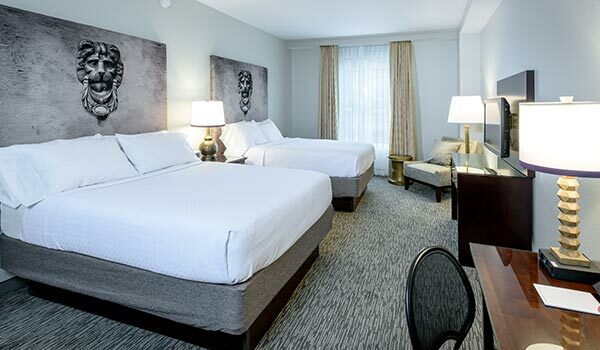 A newly renovated room located in the Alexa Tower, these rooms feature two queen, an executive work desk and chair, spacious bathroom, high ceilings, and pay movie channels. Free basic High Speed wireless internet is available and upgraded speeds for optional purchase. The hotel is 100 percent nonsmoking.